Up Against It: The avant-garde string quartet Ethel support Todd Rundgren and Joe Jackson in their Ortonesque quest. Music fans can thank the Beatles for enabling this spring's pairing of Todd Rundgren and Joe Jackson on tour together. The two artists, both known as inventive, adventurous and stubbornly individualistic songwriters, had never met for anything more than perhaps a handshake until last May when the Beatles unwittingly united them. Back in 1989, Rundgren had been asked to write the music for a stage production of a script written by the late English playwright Joe Orton (Loot, What the Butler Saw) that had originally been intended to be the Beatles' third movie. Orton, who wrote the script for the Fab Four in 1966, was at the time one of the most popular writers on the London scene. The Beatles rejected his initial draft, manager Brian Epstein telling Orton that it wasn't "suitable." Orton agreed to do a rewrite, and a chauffeur was sent to pick the playwright up for a meeting with the band. The driver reportedly knocked, heard no answer and looked through the mail slot. Inside the apartment, Orton lay dead on his bed, bludgeoned in the head with a hammer by his lover Kenneth Halliwell, who was slumped at his desk, the victim of a pill overdose. Three weeks later, Epstein also died of an overdose. Orton's play, titled Up Against It, was given to Rundgren in 1989 for his talents as a composer. Using the stage musicals of Gilbert and Sullivan, and Bertolt Brecht and Kurt Weill as inspiration rather than trying to write imitation Beatles music, Rundgren has done little with the music since, other than including revamped versions of a couple of those songs on his 1989 album Nearly Human. "I'm not somebody who can actually write sheet music out with any degree of ease," Rundgren says in an interview from his Hawaii home just prior to his tour with Jackson. "So all of my transcriptions were essentially the recorded demos of the songs. I had all of those collected. About eight years ago, I essentially dressed them up a bit and released them as an album that only came out in Japan." Last spring, Rundgren was asked to put together a new production of Up Against It. A benefit performance was held in May 2004 at Joe's Pub, a New York cabaret venue attached to the Public Theater. "To cut a long story short, Joe [Jackson], who has a place in New York and spends some time of the year there, had his management call up and ask if there was any little part or something that Joe could do in this revival," Rundgren says. "I said, 'Sure, there are a couple of guys who are not showing up, and we have a few relatively critical parts that need to be sung.' So Joe came in and rehearsed with everyone and performed, and that was all terrific and a big surprise for the audience because Joe was not billed." The organizers then approached Rundgren and Jackson about playing a show last summer as part of a Central Park concert series, with the string quartet Ethel opening. This marked the first time the two artists had ever shared a concert bill. That day, both Rundgren and Jackson performed solo sets and then joined forces with Ethel for an encore. They appear with Ethel at the Luther Burbank Center on May 20. "Everybody just kind of went berserk at the end of it," Rundgren says. "They liked the flavor of that particular meal so much that we thought, 'Well, let's see if there's any other interest outside of New York City.' And it turned out that there was enough for us to be out for about 10 weeks of touring in both the U.S. and Europe." The tour this spring follows a similar format. It comes after both Rundgren and Jackson had wrapped up significant projects. In 2003, Jackson reunited with his original band--bassist Graham Maby, guitarist Gary Sanford and drummer Dave Houghton--to record Volume 4, their first CD together since 1980's Beat Crazy. A world tour kept the foursome on the road well into 2004. Rundgren, meanwhile, released Liars, his first CD of new material since 1993's No World Order. He supported the CD with a full-band tour. Like Jackson, whose career has seen him make albums that have featured everything from edgy, punkish rock to big band to elegant pop balladry and classical music, Rundgren has shown a similar sense of exploration and accomplishment in his music. After debuting in the late 1960s in the cult band the Nazz, Rundgren embarked on a solo career that has included the landmark 1972 double album Something/Anything, which demonstrated his ability to write finely crafted soul-inflected pop, a series of albums with his now-defunct progressive rock/pop band Utopia and other solo releases that have ranged from highly experimental (the 1993 interactive CD No World Order) to highly accessible (Nearly Human). Like a number of Rundgren CDs, Liars carries a common lyrical theme. As the title suggests, the CD revolves around truth, but that one-word description doesn't really capture the intent of Rundgren's lyrics or the many facets of reality that the word "truth" entails. "If all I was to say is this is an album about truth, I don't think that would be true," Rundgren told me in a 2004 interview. "It's about all manner of reality versus nonreality, or what can be proven in the human realm versus what can't, and also things that people may not even consider to be about truth or honesty, which is their everyday reflexive behavior that makes social interactions endurable, the little lies that you tell all the time just so that you can get on with business or whatever. It's as simple as 'How are you today?' and you say 'Fine,' when you're really having things on your mind that are really compromising everything else you do, but you'd never tell anybody what it is. "I got so much material out of the topic that it was like 14 songs and 74 minutes later by the time I was finished at least with this round," Rundgren said of Liars. "And I don't even think the topic was exhausted." Todd Rundgren and Joe Jackson perform singly and together on Friday, May 20, at the LBC. 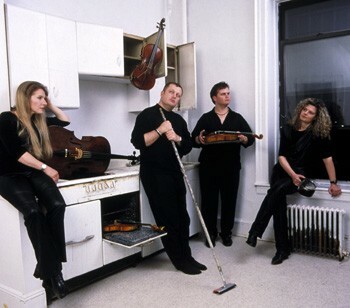 The avant-garde string quartet Ethel supports. 50 Mark West Springs Road, Santa Rosa. 8pm. $45. 707.546.3600.